For system builders looking for a bit of extra flair, NZXT has announced a new family of computer fans with RGB LEDs, whose lighting can be customized using the company’s HUE+ hardware controller as well as CAM software. The 120- and 140-mm Aer RGB fans are designed for modders and high-end system builders, who would like to add maximum customization to their rigs and change their lighting settings on the fly. The NZXT Aer RGB fans feature eight embedded LEDs covered with a special matte light-scattering material. The LEDs can be dynamically controlled using the NZXT CAM software when the fan is plugged to the company’s HUE+ module (sold separately). Each module can control up to five Aer RGB fans, which can be daisy chained, but still controlled separately. The CAM app and HUE+ modules support various presets for different lighting effects (breathing, pulse, fading, etc.) and allow users to create their own presents as well, which enables everyone to build highly-custom PCs while using off-the-shelf components. The new Aer RGB fans compliment NZXT’s LED strips, which can also be controlled using the HUE+. NZXT offers two versions of Aer RGB fans in 120 mm form-factor as well as in 140 mm form-factor. Both fans use fluid dynamic beading, feature 500 – 1500 RPM speed and can produce 31 dBA or 33 dBA of noise. The manufacturer will start to sell its Aer RGB fans in late October worldwide. Since we are talking about unique, aesthetic-focused products, they are not going to be cheap: the Aer RGB120 will cost $29.99, whereas the Aer RGB140 will be priced at $34.99. 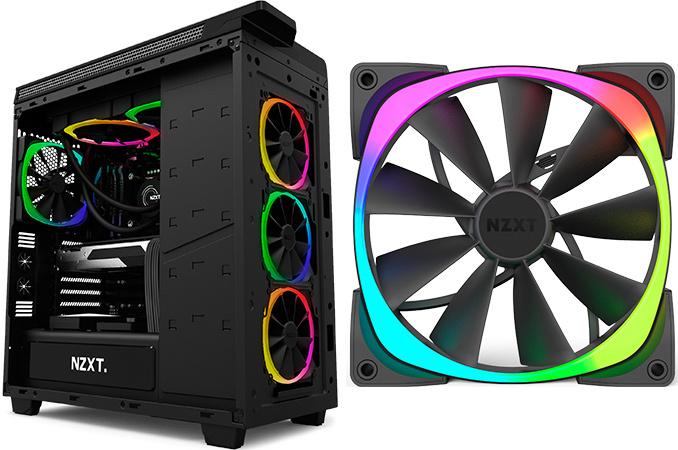 For those, who do not have a HUE+, NZXT will offer starter packs with two Aer RGB fans and one module for $79.99 (120 mm fans) and $89.99 (140 mm fans). In addition, the company will offer triple packs consisting of three fans of the same size for $79.99 (120 mm fans) and $89.99 (140 mm fans).